On April 25, CatTime.com reported on Meow, a cat that was left with a Santa Fe, NM, shelter. Nothing out of the ordinary with the surrendered pet, except it was a feline that weighed 39 pounds. 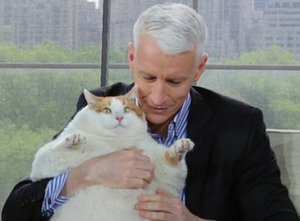 Meow with Anderson Cooper during a New York City media tour. The quickly cat became a media sensation and the poster child for pet obesity. Meow was called “courageous” and “heroic,” and was promptly shipped to New York City for a whirlwind media tour, where he appeared on the Today show and other morning programs. After the cat returned to New Mexico, he moved into a foster home. On Thursday, May 3, the cat started wheezing; two days later, he died of respiratory distress. Before Meow passed, no less than four veterinarians examined him. The cat had been on a diet to lose weight. When the initial story was posted, everyone seemed to have an opinion, and readers decried the cat’s condition. Some turned their ire toward Meow’s former owner, and called her everything from irresponsible to outright abusive in their comments. According to a piece on the Tacoma, Wash., site thenewstribune.com, Meow’s owner was hardly the monster she was painted to be, but a kind and loving pet owner who had adopted two shelter dogs. Marie Cavelti Stewart was the daughter of Meow’s owner, and she says Meow was found as a stray who happened upon her mother who was gardening when they met. After she was unable to locate the cat’s owner, Stewart’s mother took the cat as her own. More important, however, is the revelation of Meow’s special diet. After the cat developed a urinary tract infection, he was put on a diet of special dry food – approximately half a cup each day. The cat also drank only bottled water. This is at odds with the assertion in several stories that Meow was overfed table scraps, including hot dogs. Stewart’s sister died of lung cancer on April 21. At the time her sibling was living with and caring for her mother. As her mother prepared to enter a nursing home, Meow was surrendered to an animal shelter outside Roswell.